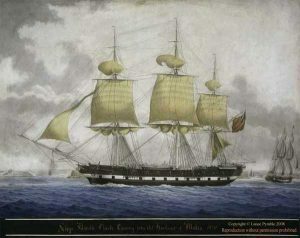 The David Clark was the first ship to bring assisted immigrants direct to Port Phillip in October 1839. All were Scots and many settled in the Kangaroo Ground and Heidelberg districts including the Bell family. To mark the 180th anniversary, descendants of those passengers are invited to attend a reunion on Sunday 27 October 2019 at Gulf Station, Yarra Glen. Gulf Station is an historic farm, now managed by the National Trust, once owned by William Bell, who was one of the passengers.